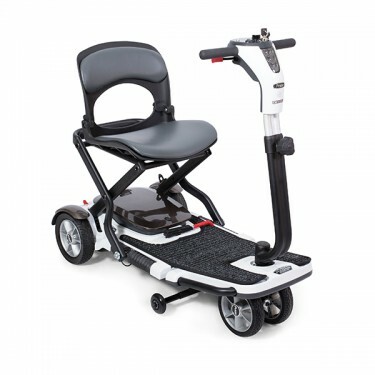 The Go-Go Folding Scooter can easily collapse in three simple steps, making stowing it in your car, cabin on a cruise ship or when at the airport a breeze; just fold the seat, pull the lever, fold and lock the tiller and you’re ready to go. 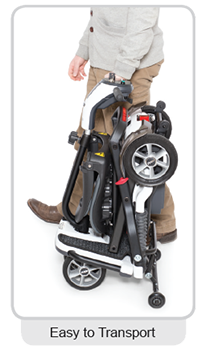 When folded, the Go-Go Folding Scooter can be stored either on its side or upright, conveniently fitting where you need it to; whether that’s the back of your truck, in the closet or off to the side at dinner. 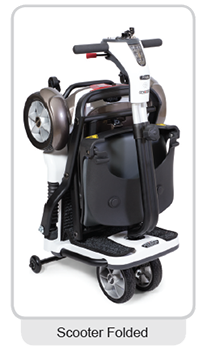 To aid in the stability while driving, the Go-Go Folding Scooter features two anti-tip wheels which double as transport wheels when folded.